If Yelp thinks a business is buying reviews, it has no problem publicly shaming the company. It's not uncommon to receive a few negative reviews, but what's the best way to handle it? Here's what you don't want to do: Call online reviewers punks, trash or other expletives on your company Facebook page like the owners of Amy's Baking Company did last spring. Their outrageous behavior became a story in and of itself -- and escalated the negative feedback far beyond where it started. While most business owners probably aren't tempted to call commenters "fat, disgusting losers" and threaten legal action, it's easy to make a misstep. Here are some tips on how to respond to negative reviews. "Fake reviews happen everywhere," says Giorgos Zervas, a Boston University marketing professor who analyzed reviews of thousands of Boston restaurants. About 80% of the restaurants had at least one "filtered" review, which means Yelp (YELP) software found it suspicious. "[It] might be real or it might be fake," he says. "But Yelp finds it suspicious enough to avoid publishing it." Yelp will publicly shame businesses it thinks buy reviews, like it did to Discount Mattress and Furniture in La Mesa, Calif. 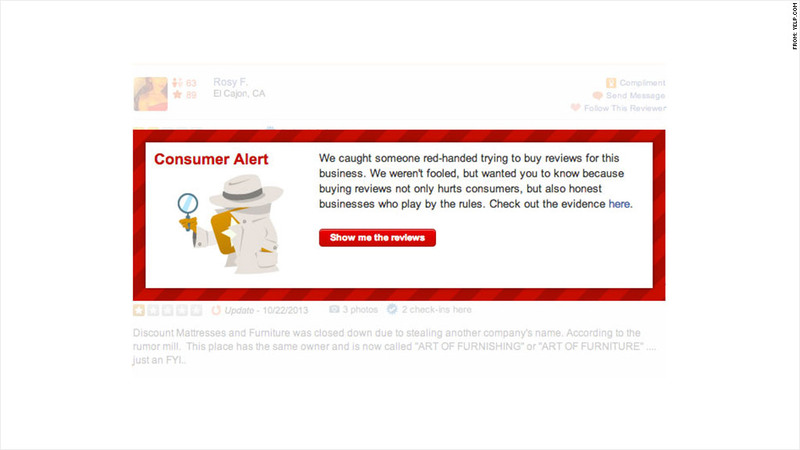 The profile has a "consumer alert," reading: "We caught someone red-handed trying to buy reviews for this business." Faking reviews can also get you in trouble with the law. Last month, officials in Taiwan investigated Samsung (SSNLF) for paying people to criticize rival HTC online. And in September, New York regulators cracked down on the same practice, forcing 19 companies to pay $350,000 in penalties. Lockbusters, a New York City locksmith, is approached often by companies offering to craft reviews, according to owner Jay Sofer. He turns them down, preferring to connect with negative reviewers personally. In a phone call or email, he asks questions, lets them vent and if the company didn't meet expectations, offers a discount or even a refund. He also prioritizes customer service. "I treat every person like a potential reviewer," he says. "I know they can praise you or trash you." His approach works: Sofer says much of his business is driven by his 5-star rating on Yelp. "If you want to take your online reputation seriously, put customer satisfaction first," he says. Wade Lombard owns Austin moving company Square Cow Movers and stresses self-restraint when responding. "Your immediate reaction is to defend yourself because your business is your baby," says Lombard. "But in the end, you would be doing yourself a disservice." When it comes to Facebook (FB) and Twitter vents, it's often more productive to have conversations in private. Hayneedle.com, an Omaha, Neb.-based online furniture store, handles Facebook complaints with direct messages, signing the name of the person who will be handling it. "It gives us the flexibility to find the best solution without multiple fans jumping into the conversation or making the customer feel like we've forgotten about them," says Donna Faust, Hayneedle's director of brand management. Once the problem is solved, the company asks the customer to write a follow-up post. Houston-based Blinds.com takes a more proactive approach. The company sends customers an email asking how they did -- hopefully catching complaints before a person vents publicly. The positive feedback has landed in marketing campaigns, and the gripes have helped identify problems at the company, says Daniel Cotlar, the chief marketing officer. "We've uncovered a lot of stuff that is broken," says Cotlar, such as software glitches, vendor problems, misleading product images or customer service holes. "For every customer who will tell you something is wrong, there are 10 people who don't bother. So you're fortunate to get that information."